So Mark is telling me about a friend of his who just sold a house in Kits, a nice neighborhood in Vancouver near where my dad lives. Kits has become quite gentrified over the years and Mark is describing the house and what it might have sold for. As an example he compares it to my older brothers house west of Kits. I say casually, that I have never been to my brothers house. It strikes me how odd this is, then I move on to another part of Mark's story. 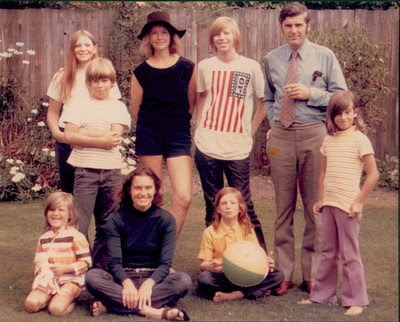 Some of the cousins, circa 1973. Anne is seated in front of my mother. My dad is not pictured, but Jim is. We are the children. Am back home after 4 days at Mark's place. I dropped Pearl at school and now I am trying to warm up the house and office. It's always a bit lonely and dark when I first get back home. Today is a little worse as I am reflecting on the recent death of Anne Ironside. Thoughts of death and loss abound. I'm tripping on them. She is not technically my aunt. One of our long-running family exchanges featured this discussion about how we called them Uncle Jim and Aunt Anne for convenience and we would lapse into the discussion of the second cousins once removed thing which was the accurate description of our familial relationship. Jim is my dad's first cousin and I think their relationship was more brotherly, they have always stayed connected, their mothers were sisters. They both went to the University of Edinburgh. Jim was a surgeon, my dad went into Anesthesia. Jim married Anne after he moved to Vancouver in the 60's and she is the mother of my two girl second cousins, Andrea and Cybele. Andrea is my age and I have always known her. So Anne was my second cousins wife and she died on Saturday of complications associated with liver disease, many sad complications. She was 72. Today I am wading around in this knowledge that she is gone and now Andrea is just like me, motherless. It was hard to call her to offer consolation because really there is nothing that can console this particular loss. You feel it in your body, in your DNA, in your womb, your bloodstream, around our brains, and in our lungs. It's so deep and feels so endless and enormous. A big empty hole blasted through your whole being. Gently, somewhere in the journey of this horrendous realization, the pain steps away and in it's place is love and deep human connection. It hurts so much and is simultaneously so beautiful. Pearl is getting over a cold at the moment so this afternoon I lit the fire and got the house nice and cozy. We ate a whole bunch of smoked salmon and she settled herself and Iggy into the couch under a quilt. She had a can of ginger ale, straw, remote, and a bowl of apple slices. My general approach to Pearl when she is sick is to keep her still and feed her. It generally works out, she has been much healthier this last year. So while she was relaxing in the house I shot out to the office to work on this print. I have been building up the layers of color. I think I have at least 2 more to add. I want to add some more type to it, a question mark, dollar sign and the beautiful number 7. These are the candidates I am interviewing for this piece. Stay tuned. Am going to sell them at UCU for $75, unframed. 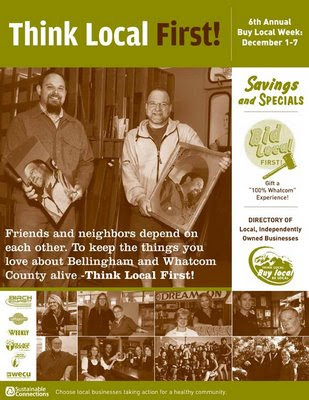 This is the cover of a 16 page insert for the Bellingham Herald advertising the upcoming Buy Local Week. I started on it Tuesday by designing the cover which was approved with little revision. I designed the rest of it on Thursday and Friday morning. It's gone to the printer now. I did do a little on work on the insert Wednesday but the press was calling me. 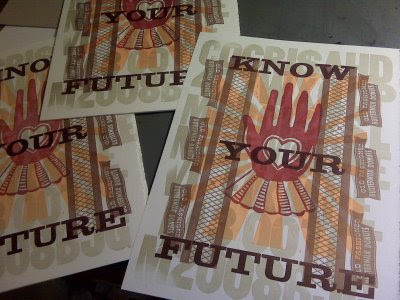 The UCU show is coming up in 2 weeks and I am cracking the whip. I printed and glued and collated for about 4 hours in the middle of the day. I enjoy the process of producing these multiples, the trick is making time to do it, clients work most often comes first, then of course there are all the other obstacles to work. Bathing, dressing, chopping wood, speaking with the hens, it all takes up time. Today feels good. I worked efficiently on this piece and I like how it came out. 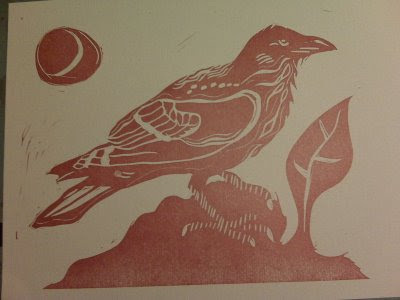 This is a lino cut I made for Jamie Bichler of Laughing Raven Designs, she makes jewelry with words stamped into various metals. I carved this the weekend Becky visited us. I parked myself at the dining room table, ate slow cooker ham and carved away. You have to go easy with it, it's very tough on the hands. I took a lot of snack breaks. So Buy Local now and then, okay then. I try and walk daily with the dog. I generally do it after I have been sitting working for a few hours. The dog watches the time and reminds me when the hour of the walk approaches. When the weather is bad I have to be ready to go if there is a break in the rain. If it snows I have no interest in walking, not sure why. Maybe the idea of survival kicks in and exercise seems less important. No snow yet this year, in fact it has been quite dry most days. Sometimes the clouds are heavy but occasionally it's sunny and then the whole effort feels more like a gift. As I get older I see the benefit of regular exercise in my routine. It burns away the nasty edgy bits of my anxiety. I feel virtuous doing it, virtue is a great thing for a naturally self loathing person like me to experience now and then. I sit a lot and getting out and moving around a bit keeps my body feeling relaxed and strong. Mostly I just prefer to be outdoors and walking is easier than working. I have taken the same walk most days for the past 14 years and I never get bored. The landscape changes daily, the direction of the wind, the smell of the air. 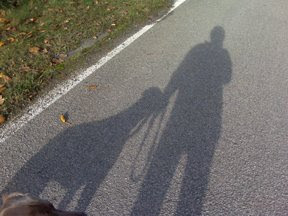 The walk is a meditation practice wherein the dog and I—connected by nylon webbing—trot along breathing in and breathing out. I watch my mind as I go along, I am petty sure the dog is functioning on a whole other plain of smell alone. It's okay, the point is this walk does a lot for both of us on many levels. In residency here at the Chuckanut Brewery in Bellingham. Waiting for friends to arrive, sitting with my little friend the laptop, my constant companion. One friend has just left, gone on to a meeting and I have a little time to kill. It's dark out now and raining and the bar is only marginally busy. They were playing Johnny Cash which always raises my spirits but honestly by this hour of the day my spirits are generally good. I have done some work, some chores and errands and listened while a friend processed some thoughts, all in all a great day. While I am alone at this very moment I am feeling quite connected to the world via the interweb and my general good vibe, which I feel is far reaching. Soon I will walk outside and feed the dog who has been in my car the whole afternoon, I will walk her and return to my command post here in the bar. It's a good reminder that everyday offers us a choice, today I chose happy, pure and simple and not to be a gluton about it or anything I may choose it again tomorrow. Just because I can. 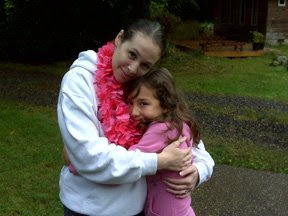 My daughter was adopted by me and my now ex-husband when she was 2 days old. We had been married for about 1o years when it became fairly obvious we were not going to get pregnant on our own. Being a pragmatist and also fiscally conservative I saw my options narrow quite comfortably to adoption, open adoption. I knew that by choosing adoption it was a matter of when not if. I set us on our course in fall of 1997 the year my mother died and miraculously by July 18th of 1998 we had our lovely daughter Pearl. Ours is an open adoption and we see Pearl's birthmother, Becky a few times a year, mostly here but occasionally in Eugene where she lives with her partner. As I reported earlier this month Pearl's dad and his wife have just had a baby and now Becky is pregnant too. Babies, babies everywhere. Becky came up this weekend to tell Pearl the good news in person and to see her new baby brother. We had a nice visit and when it was time for Becky to leave she and Pearl stood locked in a hug on the driveway. I was saying things like have a safe drive and call us when you get there. Pearl was answering for Becky in the plural, we will mom. I realized she was pretending that she was leaving with Becky. I think this is my biggest fear as a mother in this equation that one day Pearl will pack up and return to her biological family. I realize I am selling myself short in this fantasy and not seeing all the subtleties of the open adoption relationship. Ideally Pearl sees no boundaries in the families she lives amongst, she sees them as a continuous loop winding around her not individual closed loops as I have had the tendency to see them . Her relationship with Becky will change as Becky's family grows and as Pearl matures. I will not be left behind as my fear suggests, I will remain her safe harbour, the one person who has not made any changes in my original commitment to her, to be here just for her until the day I die. My roll is less glamorous, I have no siblings to offer, I am not a fantasy compiled of occasional weekend visits. She will know me better than anyone, the good and the horrible, the inconsistent and the whacky. At times I feel sort of invisible in the equation but to Pearl I am the thread that holds her whole universe together, the person who makes it all happen and the person who makes it all feel okay. All the rest of it is just the marvelous fabric that makes up the story of her life. Boots by John Fluevog I will never own. Every now and then just to punish myself I get online and look for shoes. Now that the weather is cooler and wetter I have fallen into my boot rut. I have 2 pairs of Blundstones, one round toe and one chisel toe. The chisel toes are my town boots and the round toes are the boots I wear daily around my place. When I am feeling fancy I pull on the Italian boots I bought last fall in NYC. They have been a good addition to the boot collection at Rowanville. Here is the problem. The other day I was getting dressed and I was thinking I am tired of wearing all these boots I would like to put on shoes. I was struck by two things; a) I have no shoes, and b) I can't even picture a pair of shoes I would like to wear. The reason I find myself in this predicament is that I have turned off that place in my womanly brain wherein we think about shoes, seek shoes out, and buy said shoes which in turn enables us to wear fabulous shoes to every occasion. I can't buy shoes like a regular person. I have size 14 feet which makes sense as I am over six feet tall. I don't really want high heels, I am tall enough as it is now. I just want some cute girl shoes, Mary-Janes, ballet flats, mules, whatever. But they are not to be found in any great quantity or variety. Because of this I can't even really pin point what I would want in a shoe. It's too painful and wasteful to think about. What is the point of dreaming if your dream will never be realized. For years I have worn mens shoes and this has worked to a point. As long as I dress in a semi androgenous way I am fine but the second I want to look and feel like a girly-girl I feel the cold hard slap down of reality. I dont fit society's idea of what size a woman is supposed to be. 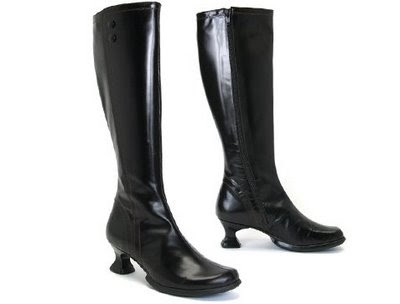 There are companies who make shoes for us tall gals but their proportions are often all off. A woman who is 5' 3" weighing about 130lbs and wears a size 8 shoe requires totally different engineering than me at 6'1" and 83kilos (I chose metric so you can't really tell my weight without doing some math, hah!). I am a bigger heavier person and I can't just slip into some flimsy shoe that has been lengthened based on a smaller design, it simply doesn't work. I found an okay shoe on the Nordstrom site last night, but that is it, one pair of shoes in the whole world that sort of look okay to me. Who knows if they will fit. I spoke with a shoe designer awhile back about custom shoes which I could have made at great expense. They are works of art. This man worked with John Fluevog in the 70's and so the shoes have that vague Stevie Nicks vibe to them which is not quite my speed. They are gorgeous and well crafted. I considered (for about 5 seconds) learning to make my own shoes. Can you imagine what they might look like? Carved from wood with moss and fern accents. What I really want to do is start my own online shoestore wherein I convince established shoe companies to make a few bigger sizes for women. We are getting bigger. When I was a teenager and needed shoes no one went over size 11. When I moved to LA in my late teens I discovered in some of the black burroughs larger sizes for that population and made trips to central LA now and then to get a few pairs but the styles were still lacking. I know I would be selling to a small customer base but man if I could make one other person feel happy about their big feet I'd feel vindicated.